Few things compare to eating a straight-from-the-oven slice of breakfast pizza. I especially like eating breakfast pizza because it brings back happy memories of the first time I made it on a lazy summer weekend with my good friend. We spent the day lounging at the pool, drinking vino verde, and stuffing ourselves with eggy, cheesy goodness (fortunately for our bikinis, these were not simultaneous activities). Luckily, I can bring back those memories any time I want because breakfast pizza is incredibly fast (no more than 20 minutes) and easy to make. First, you need to procure pizza dough. You can either make some from your favorite dough recipe, or you can pick some up from your local market like I did. When you’re ready for breakfast pizza, pre-heat your oven to 500°F. Then, lightly mist a baking sheet with cooking spray. The spray helps the crust get crispy and keeps it from sticking to your sheet. Next, stretch your pizza dough out as thinly as possible without making holes. I like doing this by picking the dough up and letting gravity stretch it out. After spreading your blank dough canvas on the pan, drizzle some olive oil on the crust and spread it around. The oil helps the crust turn brown and crispy, and if you use an olive oil infusion (I used basil), it will also add some extra flavor. It’s time to add your toppings! I used shredded mozzarella, shaved parmesan, onions, and mushrooms on this pizza. Caramelized onions and bacon would also be delicious. Then, crack a few eggs on top and season it all with salt and pepper. Bake your pizza on the lowest rack of your oven for 10-12 minutes or until the cheese starts to brown, the crust gets crispy, and the eggs are set. Using the bottom rack of your oven helps make sure your crust will be crispy. Crispiness is of the utmost importance! 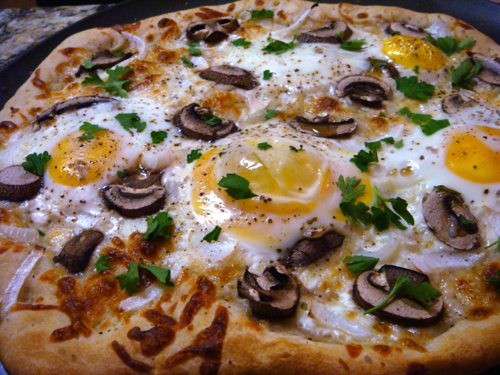 The egg yolks on my pizza were firm and chewy, but not chalky or overcooked. 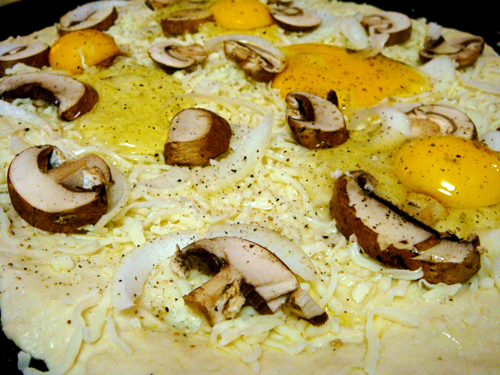 If you prefer your yolks to be on the runnier side (which makes the pizza more delicious but requires a knife and fork to eat), bake the pizza for 2 or 3 minutes before adding the eggs. When your pizza comes out of the oven, generously sprinkle it with fresh parsley to add color and extra flavor. 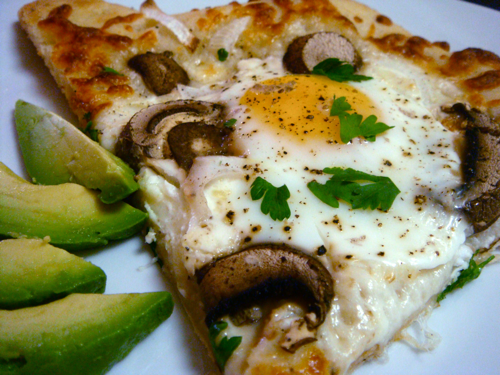 I like to serve breakfast pizza with avocado slices that I add to the pizza as I eat. Because there isn’t a sauce component to this pizza, the avocado’s moisture adds another layer of texture. Alternatively, you could dice the avocado and sprinkle it over the pizza. 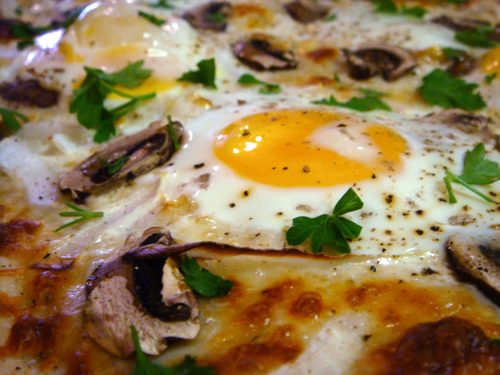 Consider making a breakfast pizza as a unique dish for your next brunch! I referred to these sources while perfecting my breakfast pizza recipe: Pioneer Woman and Smitten Kitchen.